Vegans and vegetarians rejoice. We've compiled a list of some of our favorite vegan and vegetarian dishes to serve during the holidays. 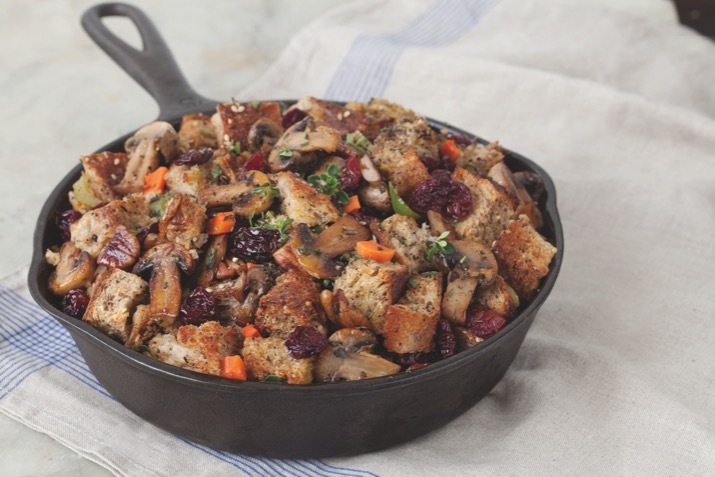 This delightful stuffing is delicious for any Thanksgiving meal. Serve it with tofu steak and mushroom gravy for vegans. Add a pan-fried tofu steak and mushroom gravy to this vegan stuffing for your favorite vegetarian Thanksgiving guest. These easy sweet potatoes are sure to bring compliments as a holiday side dish. The coconut milk makes them extra flavorful – and dairy-free. This tasty latke variation can be enjoyed with applesauce, chipotle sour cream, and horseradish sauce. The tangy and sweet qualities of both parsnips and apples combine in this delicious and hearty fall soup. Acorn squash is perfect for stuffing. This filling has Mediterranean flair: olives, white beans and Parmesan cheese. Packed with a flavorful medley of chewy wild rice and three kinds of mushrooms, this frittata is great any time of day. This savory, vitamin-rich casserole makes a hearty accompaniment to roasted poultry or ham, or atop baked polenta. Try this roasted-vegetable free-form tart as an appetizer or side for a special dinner or as a vegetarian main dish. Tempeh, made from fermented soybeans, gives a deep flavor and meaty texture to Dana Tomlin's vegetarian taco filling. Crumble tempeh into a small bowl. Heat oil in a medium sized skillet or sauté pan over medium heat. Add tempeh and cook for 2-3 minutes. Add garlic and cook for 15-20 seconds until aromatic. Add chili powder, pepper, tamari, and water. Mix well and sauté a few minutes more until liquid evaporates. Note: Add additional oil if tempeh is sticking to pan. Serve with fresh corn tortillas and your favorite taco fixings.